Gwen White, Psy.D., is Professor Emerta from Eastern University where she formerly served as Director of the Doctoral Programs in Marriage and Family therapy. She is a licensed psychologist in Pennsylvania and founded Circle Counseling in 1997, a counseling center in Philadelphia offering professional mental health services grounded in faith. Dr. White earned her BA (with a secondary teaching certificate) from the University of California, Riverside; her MA in Counseling from Eastern University; and her Psy.D. from Immaculata University in Clinical Psychology. 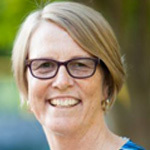 Having served at the Hospital of the University of Pennsylvania in the neuropsychology wing of rehabilitative medicine, her research interests include: the application of neuroscience to helping relationships, counselor training and supervision, spirituality and counseling practice, mentoring relationships, compassion fatigue, trauma and religious experience. She has trained therapists internationally in the identification and treatment of Compassion Fatigue and Integrating Spirituality into Clinical Practice. She and her husband live in West Philadelphia and enjoy their four adult sons and their growing families with nine grandchildren nearby to play with.